The NB Forrest Class of 1969 50th REUNION is now less than a 1 week away!! This is a once in a life time event - don't miss it. 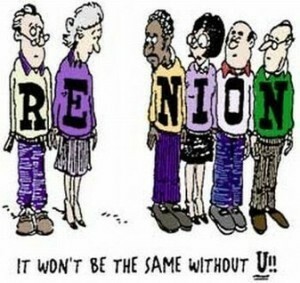 Click on the "50th Reunion Schedule/Info" link - 2nd down on the left to register. Reunion Trivia Contest - Saturday night - just for fun. Topics include life back-in-the-day at NB Forrest and key events that happened Locally, Nationally, and Intergalactically. No prep needed and besides, it wouldn't help. Reunion Dress Recommendations - Resort or Beach Casual for both Friday and Saturday nights. Swimsuits highly recommended when swimming in the ocean or pool. Golf on Saturday - Only 2 spots left if you're interested. Contact Ron Moody or Jim Sumara. Saturday Afternoon Meet-up Place - to grab a drink and chat later Saturday afternoon around 3:30 at the Hampton Inn Tiki Bar. If the golfers aren't back, start without them! Easy to Register - just send in your $25 and you're in. Click on the "50th Reunion Schedule/Info" link - 2nd link down on the left.